The Pacific Association of Supreme Audit Institutions (PASAI) in partnership with the Office of the Controller and Auditor-General of Samoa, delivered a two-day workshop on the “Financial oversight and external scrutiny roles of Samoa’s Legislative Committees” on 19-20 January 2017 at the Samoa Parliament Conference facility. Twenty of the 24 members of five Parliamentary Committees of Samoa attended the workshop opened by the Honourable Speaker of Parliament, Hon Leaupepe Taimaaiono Toleafoa Faafisi. In his opening remarks, Hon Leaupepe Taimaaiono Toleafoa Faafisi stressed the importance of this workshop for members of the five Parliamentary Committees, and was delighted at the opportunity for PASAI to deliver this workshop for the Samoa Legislative Assembly. 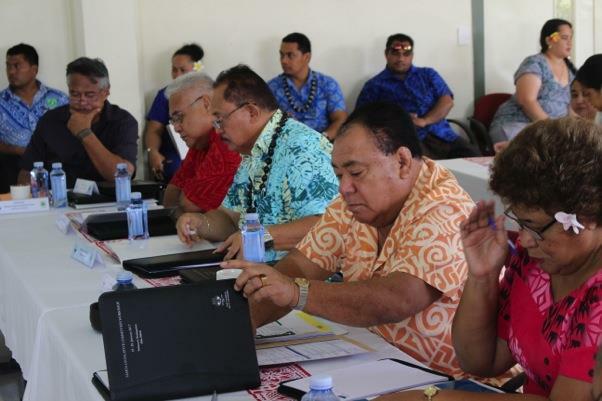 This workshop is the sixth one that PASAI has delivered in the region with the aim to build the capacity of the Members of Parliament who are also Members of Parliamentary Committees. The objective was to help them better understand their role in providing financial oversight of public expenditure, as well as better understand the specific role of legislative committees within the processes of Parliament. Fuimaono Papalii C.G. Afele, Controller and Auditor-General of Samoa hosted the workshop, and was supported by the PASAI Advocacy Team, Mr Eroni Vatuloka, PASAI Advocate, and Ms Aolele Su’a Aloese, Director of Advocacy, Engagement and Financing in delivering this workshop. A committee member during the sessions commented that “there is a need for building the capacity of Committee members as many are non-accountants and are not familiar with accounting and financial terminologies contained in the audit reports or in the financial statements of the audit entities. A training of this type targeted at non-accountant Parliamentarians will be most helpful in performing their financial oversight and external scrutiny role”. The outcomes of the workshop include proposals for: enhancing the efficiency and effectiveness of the parliamentary committees; increasing efforts in the evaluation of performance of government entities; strengthening the Office of the Controller and Auditor- General; and engaging PASAI to assist in capacity building of the parliamentarians. This programme comes under Strategic Priority 2: Advocacy for governance, accountability and transparency, of PASAI’s long-term strategic plan. PASAI is very grateful for the excellent support by the Hon. Speaker of Parliament and his staff, and also the Controller and Auditor-General of Samoa and his team in organising this workshop. PASAI also acknowledges the valued support from the Australian Department of Foreign Affairs and Trade and the New Zealand Ministry of Foreign Affairs and Trade. Workshop Participants from Parliamentary Committee members of Samoa, the Controller and Auditor-General of Samoa and the PASAI Advocacy team.